Melacare Forte cream contains Hydroquinone 4/Mometasone Furoate 0.1/Tretinoin 0.025. 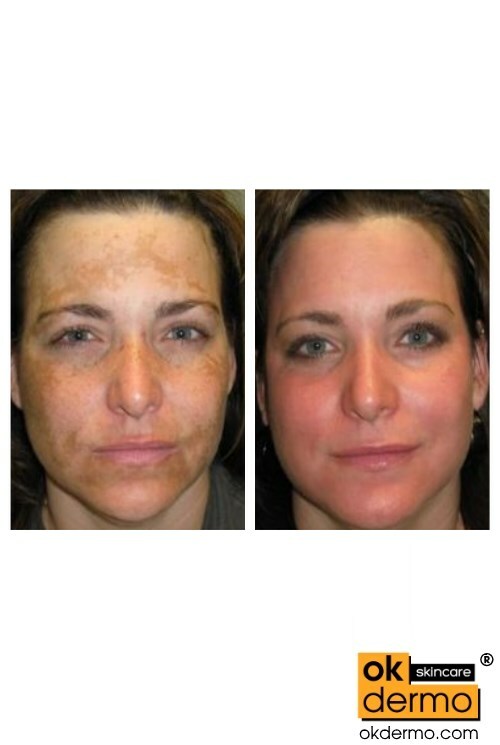 That components used together to eliminate the chronic skin disorder melasma. Melacare Forte cream is prescribed for the treatment of dry skin, rough dark patches, facial hyperpigmentation, age spots, skin discolorations associated with pregnancy, skin trauma, birth control pills along with several other problems, lightens light brown color patches on the skin as well. Melacare Forte cream is made by reputable Ajanta and generally prescribed for the treatment of rough dark brown patches and hyperpigmentated skin conditions, age spots, skin discolorations associated with pregnancy, skin trauma, birth control pills along with several other problems. Melacare Forte cream contains the salts of hydroquinone 4 percent, mometasone furoate 0.1 percent and tretinoin 0.025 percent as active ingredients. 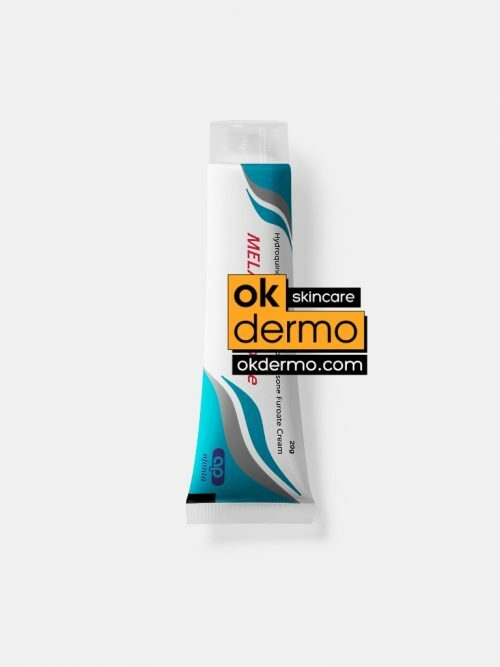 Melacare Forte cream is a topical cream containing a combination of elements that are used together to eliminate the chronic skin disorder melasma. 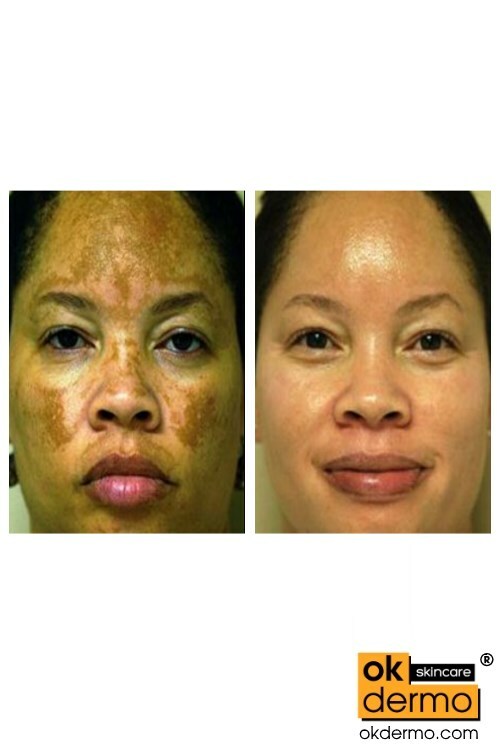 Melasma is characterised by symmetrical, blotchy, brownish facial pigmentation caused by over production of melanin by the pigment-producing cells melanocytes. It is thought to have a genetic predisposition and may be triggered by various factors including sun exposure, pregnancy, hormone treatments, some toiletries, and hypothyroidism. The production of melanin is controlled by the enzyme tyrosine in melanocytes. Hydroquinone 4% is a strong tyrosinase inhibitor that inhibits the formation of melanin by melanocytes and thereby lightens the skin. Tretinoin 0.025% is a keratolytic with anti-inflammatory properties that works by binding to specific retinoic acid receptors in the nucleus of skin cells to regulate growth and differentiation, by enhancing skin epithelial cell proliferation and accelerating epithelial differentiation. Tretinoin in Melacare Forte cream also blocks the hardening processes of the outer skin layer and increases the shedding of old hardened skin cells, while at the same time promoting growth of new skin cells. This process speeds up skin cell turnover which has the effect of lightening the skin. Mometasone Furoate 0.1% is an anti-inflammatory component that works by blocking the production of inflammatory chemicals, like prostaglandins and leukotrienes; and also narrows and constricts causes blood vessels that have become dilated (widened) and leaky allowing other inflammatory cells into the skin to escalate the inflammatory response. 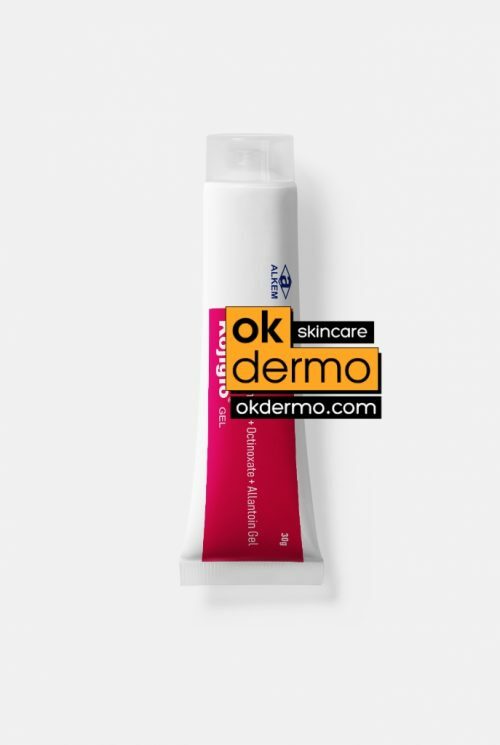 This action of Mometasone Furoate 0.1% in Melacare Forte cream reduces the risk of developing contact dermatitis that may be caused by hydroquinone 4% and tretinoin 0.025%. This combination of strong cosmeceutical components for melasma treatment has been found to provide better improvement than treatment with a single component. Reducing the accumulation of skin pigment and hampers important processes within the cells. Reducing the production of substances in the body that cause inflammation and allergies. Some of these side-effects may be very rare or not found if the salt or molecule is in trace amounts. Not every side effect occurs in every person. Please consult your dermatologist if you observe any of these side effects even in mild form: sensitivity to sunlight, skin reaction, stchy, snflamed skin, mild to moderate irritation, sore. Certain herbs, medicines and supplements and salt interactions may increase or decrease the activity of Melacare Forte cream when taken together. Melacare Forte Cream may interact with the following salts: Alcohol, Benzoyl peroxide, Itraconazole, Minoxidil, Omacetaxine, Prednisolone. Not recommended to use Melacare Forte cream in the following situations: application on eczematous, hypersensitivity, irritated or injured skin, lactation, pregnancy, peroxide, phenol. Inflammation from acne blemishes can overstimulate the skin’s pigment-producing cells and cause them to create too much melanin, as a result skin darkening in some particular areas. 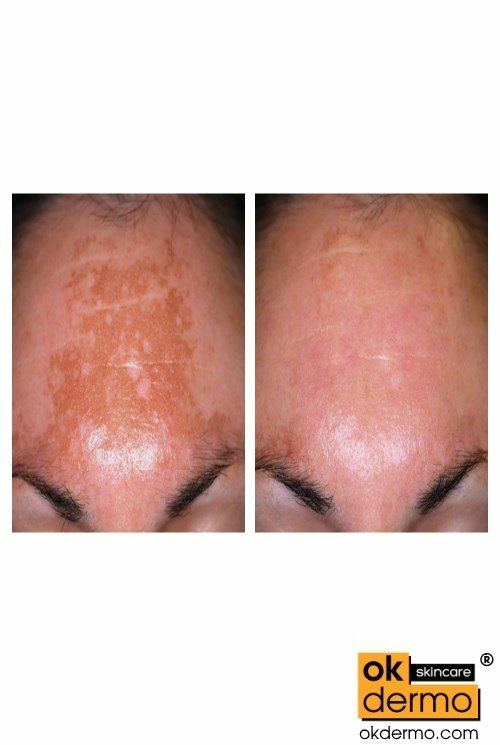 Once the blemishes clear, they frequently leave behind small, dark blotches on the skin that are known as postinflammatory hyperpigmentation. Due to the higher levels of melanin in darker skin tones, people of color are particularly susceptible to the development of post-acne skin discolorations. To help these dark spots fade eventually, several measures can be taken. Use an adequate sunscreen. Apply a broad spectrum sunscreen with an SPF of 30 or higher to your face at least 30 minutes before going outside. If you skin is oily, use a sunscreen in gel or spray form that is non-comedogenic, which means that it does not clog pores. The ultraviolet rays of the sun can overstimulate the melanin-producing cells in the skin, which can exacerbate existing skin discoloration issues. Therefore, protecting your skin from the sun is essential. Avoid benzoyl peroxide products. While the antibacterial properties of benzoyl peroxide can help control acne, the medication can also cause dryness and skin irritation. This can worsen postinflammatory hyperpigmentation and lengthen its duration, particularly for people with darker skin tones. Use a topical retinoid medicated creams like Retin-A, Tretin, Retin-A Micro to control acne. If you are still experiencing breakouts, talk to your dermatologist about using a prescription strength topical retinoids, such as tazarotene or tretinoin, to prevent future blemishes. These medicatied creams tend to be less irritating to the skin if used as directed. Apply a small, pea-sized amount to clean skin on a nightly basis. Use a skin lightening cream, such as hydroquinone 2% or 4% like Melacare or Melacare Forte, once your acne has cleared. With continued use, hydroquinone lightens skin discolorations by blocking the production of melanin. For 2% hydroquinone cream, apply small amount to the entire face, once a day after cleansing. 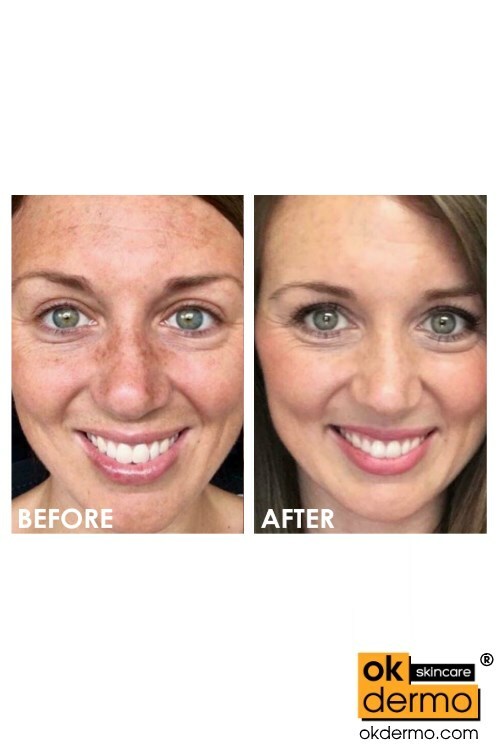 Apply the 4% hydroquinone only to the hyperpigmented areas, once or twice a day. Since hydroquinone can take quite some time to generate results, you may need to use the medication for up to four months. I have hyperpigmentation around my mouth. I used this for 2 months and it did not lighten my skin at all. It actually it actually made the area a shade darker. My face is usually really red, it’s helped and even out compection. Used it mostly every day for a month and can see a difference. I will buy product again. But do not recommended to use this cream longer than 3-4 months in a row, alterate it with azelaic acid strong creams. This cream does a good job ridding of pimple scars on darker skin. It also use to lighten spots of skin that are unevenly darker. It’s temporary. I do not use to become a different skin tone. Only to tone. I only need to use it for a few days to get results. I use this to diminish sun spots. It’s been a couple of weeks and they are starting to diminish and my skin has a glow. I can’t wait to see what my skin looks like in 2 months. I’ve tried a lot of lightening creams. This won is really good. I can see a huge difference, some of the spots on my face are totally gone. No irritation or burning. I am very pleased. I loved this cream. I bought it for scars caused by ingrown hairs, the smell is pretty strong so beware, but does it work? yes! you just have to be consistent like you should be with any of these products when your after a result. it didn’t do magic because of course the scars didn’t completely disappear, but how could that be expected anyway? point is, it worked and I got to wear bathing suits comfortably after using this. Not advisable to all skin types. Suggested for normal skins. The product has lighten the dark marks that was left after bad eczema outbreak. I love the product. In a few more weeks I’m sure if it will be all cleared and back to normal. Like it but don’t use it all the time. My skin is very light l only use it if I see dark circles trying to come around my eyes and dilute super small amount with my paraffin moisturizer. This will work. Smells horrible but it does help with discoloration. Awesome results, prices are also great!! Thanx okdermo, got 2 more! Fading spots fast! Love it, my tube lasts me half a year! It works very quickly and well effective. I did as i was told and used it regularly for three to four days without no real results. Good old school product with many usages. I used for discoloration on my elbows and knees.